I am pleased to be able to present you to my new YouTube Channel Moving Experience. Moving Experience combines knowledge of Argentine Tango and The Feldenkrais Method (an alternative to Yoga and Pilates). Learn to dance, play sports and simply move with ease. 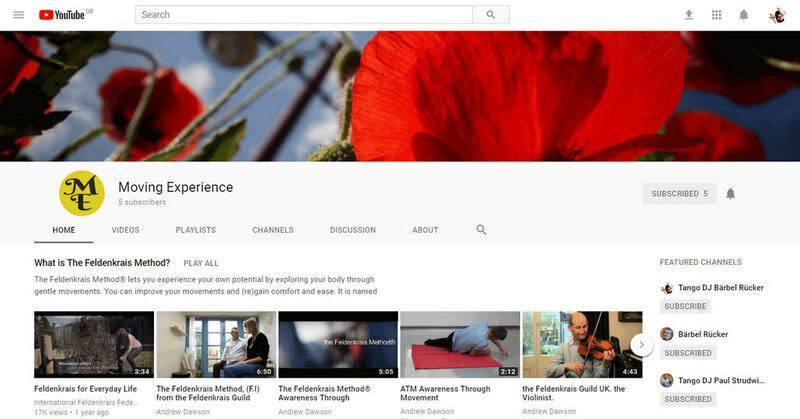 On the Moving Experience Channel you’ll find videos related to The Feldenkrais Method & Argentine Tango. Playlists about The Feldenkrais Method and what it actually is, as well as examples on Awareness Through Movement (ATM) classes and the Functional Integration (FI) work. You’ll find playlists on Argentine Tango dancing, tango practice tips, inspiring talks and more. Yes, you will even be able to see me in action. Dancing tango myself, teaching and DJ’ing. There are even videos with me out there from my Feldenkrais Practitioner training Bern II. PLAYLIST - What is The Feldenkrais Method? The videos of this playlist will help you understand the benefits of this amazing method. E.g. this one: ‘The Feldenkrais Method® Awareness Through Movement (ATM) the Feldenkrais Guild UK’. The DOUBLE BILL Milongas organised by The Magic Roundabout Milongas are two informal milongas with traditional music and cortinas and with a break for food inbetween. The regular Tango DJs are Paul Strudwick & Bärbel Rücker. The venue is Kington Langley Village Hall near Chippenham close to the M4. Read more about The Magic Roundabout Milongas.